This article is from University of Arkansas women’s head basketball coach Mike Neighbors and one of his Newsletters. Coach Neighbors has an outstanding newsletter. If you are interested in subscribing, email me and I will pass along your interest and your email address to him. This article was written while he was coaching at Washington. While John Wooden’s record for NCAA Championships may never be broken, I believe the greatest coaching feat of my lifetime has been Pete Carril winning 500 games, earning 11 NCAA tourney berths WITHOUT a scholarship player!!! I can still remember watching the back-door cut his Princeton Tigers ran to beat the defending National Champions, UCLA, in 1996. And while I am not nearly smart enough to teach the Princeton offense, I have studied almost every other aspect of this great coach and his career. Maybe it’s the simplistic side of me, but to me that is just about the most brilliant, simple thought ever. So… what things do you have to do a lot to be a good basketball coach, a good basketball player, and a good basketball team. Today, I will share with you the FIVE things that I have done myself, with our teams, and with our players over the last 35 years. 2) LISTEN: Hearing and listening are two completely separate things. You must listen to your staff, your players, your managers, your athletic trainers, your administration… You surround yourself with good people. So, listen to their ideas, their critiques, their problems. This builds TRUST and TRUST builds championship cultures and identities. 3) COMMUNICATE: Your ability to do this as a coach has direct reflection on quality of your program and the quality of the people associated with it. In the iY Generation there is still no better way to make someone feel special than a handwritten note. A face to face encounter shows importance. Don’t totally discount the value of the technology we all have access to. Text message, face book, Twitter, and Instagram should all be resources in your arsenal. Follow me @coachneighbors on twitter or “nabes22” on instagram for examples on how I connected with people. 4) MAKE DECISIONS: “The Village Idiot can do 95% of your job, boy. It’s the 5% of the things you have to do that separate you from them.”- Papa Neighbors. I grew up with that advice in my ear from a young age no matter what I was doing. As a coach it couldn’t be more true. You must make the decisions that will mold your team and your program. You get paid to be right more often than you are wrong. It takes experience. If you don’t have experience…READ!! Email me for faves on this. 5) PRACTICE: Over the course of a full calendar year, you practice at least 5 times more often as you play a game. You must be good at planning and executing a practice. Every effective practice I have ever planned took at least twice as long to plan than it does to execute. All three of these drills are posted below. 2) CLOSE OUT: No matter what defense you play, you will do this A LOT!! 1) READ: “The man who chooses not to read is no different from the man who can NOT read”. You MUST make time to read. It’s the only way to gain experience. It’s the only way you will catch up to coaches who have more experience than you!! 2) WRITE: When you put your thoughts on paper and in ink, they become yours. Your words become your philosophy. If you have everything “in your head” it’s not stated. And until you STATE them, it’s simply not yours. Choose a simple topic… Rebounding… Write out your thoughts. You will be surprised how much thinking you will do on it before you are willing to share with someone else!! 3) OBSERVE: Go to clinics. Attend practices. Watch DVD’s. Go on-line and use YOUTUBE or VIMEO. You can spend hours on hours. I have been watching NBA TV Training Camp and getting new ideas every hour. Again you are making the choice to or NOT to learn from others. If you already KNOW IT ALL, let me know so I can come observe YOU!! 4) REACH OUT: There are so many resources out there. If you aren’t reaching out to others, you are losing ground to those who do. There are coaches all over the country willing to share. There are blogs. There are Newsletters. There are YOUTUBE channels. All with coaches willing to give back what others have shared with them. As Don Meyer shares “collect all the good ideas whether you use them OR not”. Divide teams into two colors. Each team will have a player at the elbow, the block, and the wing behind the 3‐point arc. 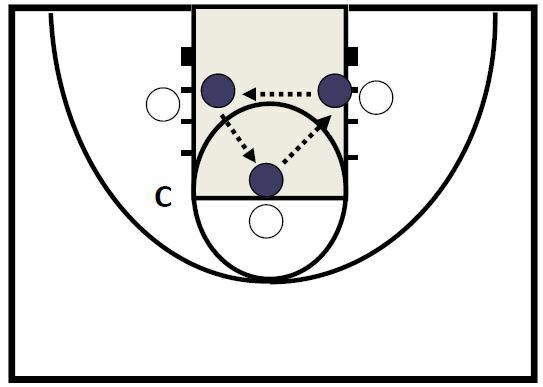 Coach will pass ball to the player beyond the arc to initiate the action. White team elbow player sets a legal screen on the blue team player sprinting from elbow to contest the shot. White team block player fights for space against blue team player crashing from opposite block. White team player who receives pass from coach attempts a shot against the contest of player fighting through the screen. Blue team player from elbow sprints to fight for position against the white team player who just set the screen. Action is repeated with Blue team receiving the pass from the coach. from the block to sprint to contest. 2) you can also vary the amount you allow the screens to be moved. We use our men’s practice team as the offensive rebounder in this drill. If you don’t have a full team of men’s players, borrow a JV player from them for a drill. Worst case scenario pick your own best offensive rebounder (or two) and incentivize the drill for them somehow. The offensive rebounder has a football blocking pad in one hand. The defender will HIT the pad. The defensive rebounder must keep the offensive player from rebounding the miss. If the offensive player can get the ball with a pad in one hand the defensive player must go again. We have ten players, so we put 8:00 on the clock. The entire team must get a rebound versus the offense to complete the GET ONE. White team players have blocking pads. Coach has ball. Coach starts dribbling the ball and blue team players begin rotating clockwise HITTING the pads of each player as the do. HIT should be quick and forceful. When coach picks up dribble to shoot, players call shot and HIT the pad they are closest to then GIT the rebound. We do this until each of the players have gotten a rebound, then we flip it over. We also do until the group gets a set number as a team before flipping. Always focusing on the TECHNIQUE as we are developing TOUGHNESS. Drop the pads and allow the offense to go live to simulate true game situations and also work on your offensive rebound. I absolutely loved this article. It made me think a lot about different ways to improve myself as a coach and mentor to my players. This article was very helpful.